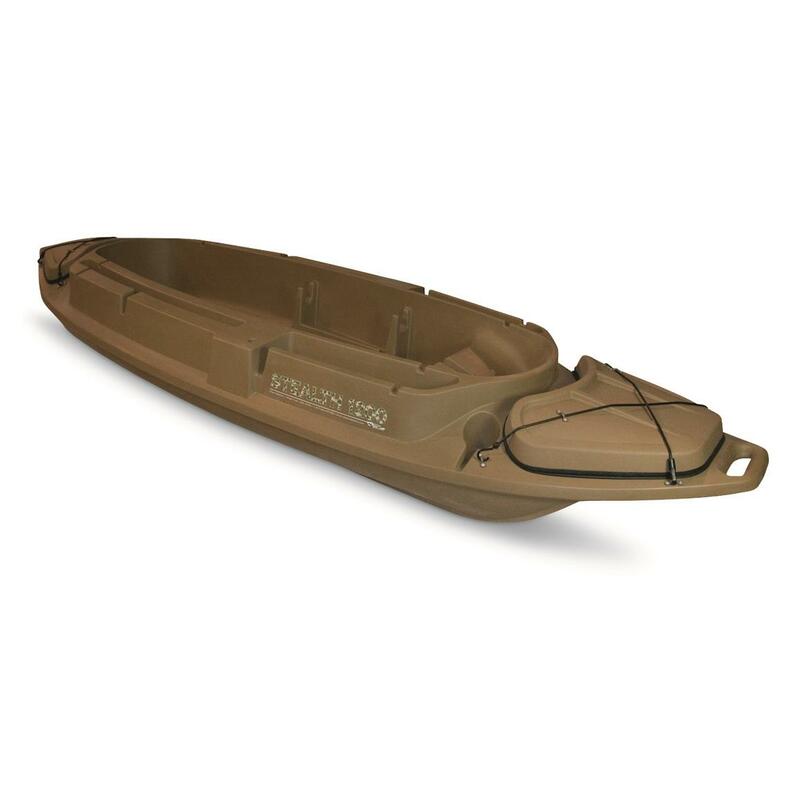 All the comfort of a top-of-the-line pit, in a highly-portable laydown duck boat, and it can float in just a few inches of water! So stable, the North American Hunting Club gave it their Seal of Approval! Go ahead - stand up, move around, put a foot up on the transom…it's virtually unsinkable. Of course, the excellence doesn't end with stability. The 8' x 3' cockpit features twin gun racks, a shell holder, and cup holder to keep gear organized. 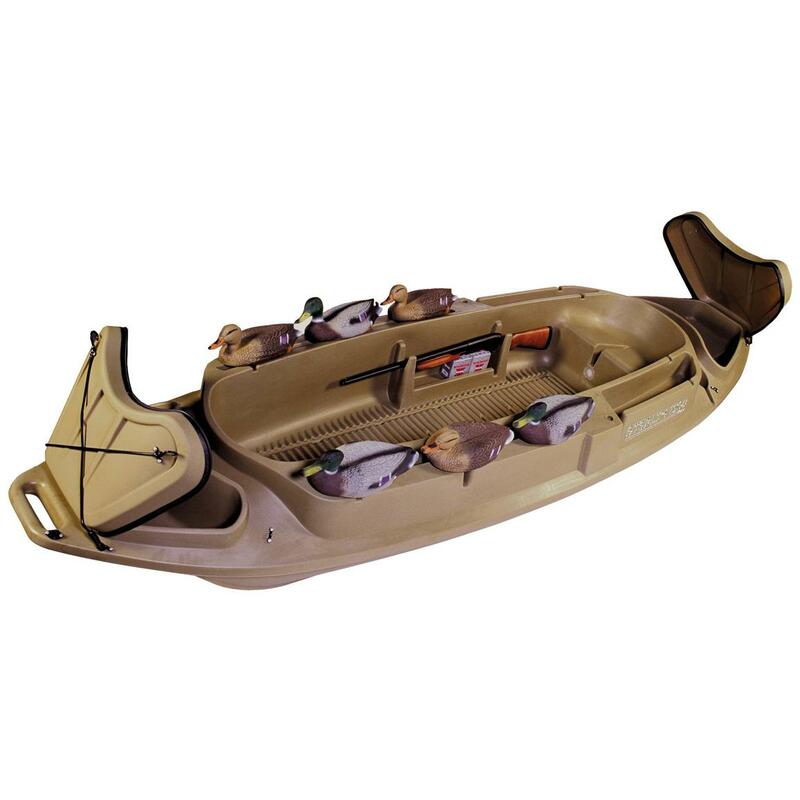 Watertight compartment at each end, 2 side storage slots, a gun rack with shell holder keep your gear organized. Decoy slots at both ends keep 12 standard-sized decoys within reach. Unmatched stability, comfort and smart storage at an unbeatable price…the Stealth 1200 might just be the best value in duck boats! Plus, you can accessorize it with motor mount, extra seat, oarlocks and more. Please Note: This item is shipped by commercial carrier curbside. This product ships in 1 box: measures 144"l. x 44"w. x 20"h., weighs approx. 150 lbs. No expedited delivery. High-value orders require a physical street address, otherwise insurance costs will be added to the shipping total. Measures 12'l. x 3'8"w. x 1'5"d. overall. Weighs 110 lbs. Cockpit Dimensions: 8'l. x 2'3"w. x 1'1"d.
Beavertail Stealth 1200 Sneak Boat is rated 5.0 out of 5 by 4. Rated 5 out of 5 by Crash77 from Great Boat A touch heavier than expected, but very well made. Plenty of room and comfortable to hunt or fish out of. Rated 5 out of 5 by DenWen86 from Great Price, Great Quality Can't wait to hunt out of it. Been using it training my Lab to hunt out of it using the Beavertail dog ramp. Extremely stable, easy to maneuver, plenty of room, and well laid out.